The Daniel Pierce Library is nestled in the scenic Catskill Mountains just 100 miles from New York City. Daniel Pierce, a successful native son, donated the original building, which was completed in 1902. Today, more than 100 years later, the original 1902 building is restored to its former beauty, and a new 23,500 square-foot addition houses a Children’s Literacy Center, Reading Room, Community Center, and Computer facilities with free, building-wide WiFi access. People of all ages regularly utilize the Daniel Pierce Library facilities. The majority of the renovation was completed by volunteers from the local communities. As part of the renovations and addition Handi-Lift was commissioned to furnish and install a custom wheelchair lift that would fit the aesthetics of the new and restored space. We used a standard Garaventa SW 42 model lift with custom paint. Both lower and upper entrance were custom built with special Stainless Steel shoes to house interlocks and bare edge glass doors. The entrances were built by one of our local fabricators as standalone assemblies incorporating Dorma BTS floor closers, Garaventa Powerlock 2000 Interlocks, custom patch hardware, and custom pull handles. These assemblies are designed to be easily mounted to blocking provided by the contractor. 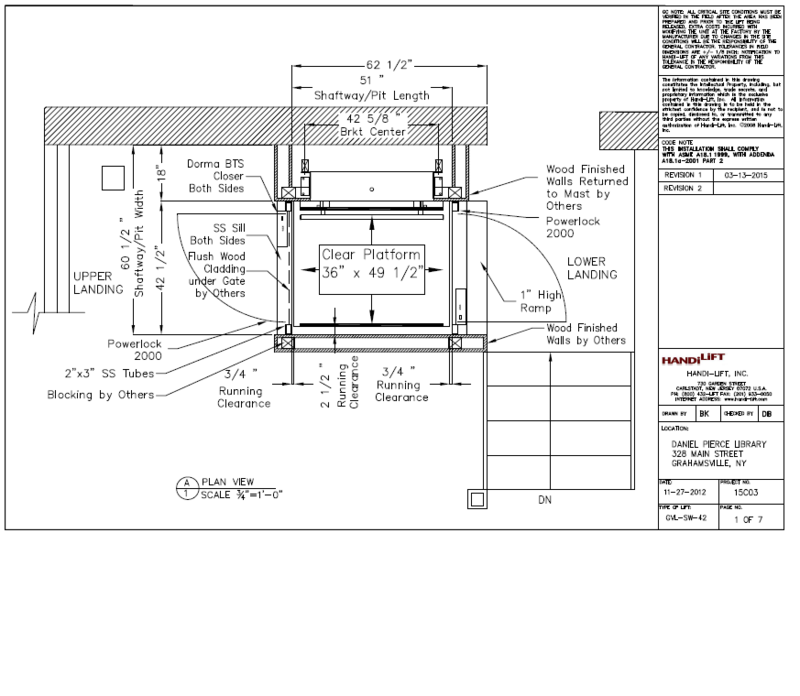 As with all of our custom units we provided detail shops drawings with coordination details and multiple site visits to ensure the best possible outcome. Because of an incredible Library Board, a dedicated staff, a heroic volunteer network, and wonderfully supportive patrons, the Daniel Pierce Library continues to fulfill its mission of providing excellent library services to the residents of the Tri-Valley community and Handi-Lift is proud to be a part of providing Accessibility with Dignity.